IT’S Mayfly time and you only need to take notice of what’s going on around you to have the best fun you will ever have with a fly rod and some hard-fighting trout. In late May, the weather is glorious, mayfly are hatching and there’s virtually no-one on the water. In between the twittering of swallows and the ever-present hum of traffic there’s an occasional heavy splash. We are at Barnes Lakes, near Standlake in Oxfordshire, and I’m frantically tying on a dry Mayfly pattern while photographer Peter Gathercole is nagging me to get on with things, as the afternoon light is perfect! Amazingly, there are only a couple of other anglers on the water but this could be the scenario on virtually any stillwater fishery. Why do so few anglers take advantage of what is one of the best periods in the flyfishing calendar? When trout are rising freely to an easily-identifiable fly and will readily accept an artificial, it’s surely about as good as it gets. Plus, it happens during arguably the most pleasant time of the year with long, warm days when nature is doing its utmost to put on a show. There are scores of stillwaters where mayfly hatch in large numbers and yet many of the regulars on these fisheries have either left before the hatch begins or stubbornly refuse to try a dry. It’s such a shame as this really is a fun way to fish as well as being very satisfying. It’s hard not to be at ease with life at Barnes Lakes and from the cosy lodge through to the immaculate grassed areas and beautifully tended hedgerows, it is all too apparent that John Barnes is immensely proud of his fishery. He runs it to appeal to those who like a fair day with a bit of a challenge. All he asks is that you use conventional flies and don’t overstep the limit for catch-and-release or catch-and-kill. Insist on using big lures or behave badly and you won’t be welcome to return. In essence, fish as though you personally own the water. There can’t be a better maxim than that. My challenge was to catch something for Peter’s cameras and to have a play with a pattern I’d been developing over the winter to see if it worked. I am one of those guys who’s constantly looking around and, on small waters, I often notice adult mayfly on the surface, particularly during calm periods, but they just seem to stay there even though heavy rises are happening. It seems that the fish must be selecting the hatching stage and leaving the adult insect alone. Even during periods when there’s a ripple on the water and fish are taking the adult, I’ll still see feeding evidence without spotting a fly. The obvious conclusion is that the fish really like to take the fly just before and during its hatching stage. This is called the emerger stage and is well known to anyone who enjoys fishing chironomid (buzzer) imitations - there are already some effective Mayfly emergers too. But I wanted to put some movement into my imitation. I’d often watch the nymph coming to the surface with a most attractive wiggle and then it would move along in the surface film while struggling to hatch. I came up with an odd-looking creation using a Kamasan B810 hook, intended for Klinkhamer tyings and always incongruously large for a size 10 (click here to see). It’s more tedious to tie than most of my patterns but I assure you it works and is worth the extra effort at the vice. When fishing the fly I usually cover an area where I've seen a fish move and either let it drift if there's surface movement, or impart the occasional twitch or a very slow retrieve. All options work and I think some trout actively cover quite a large area looking for the hatching fly, which is why a direct cast to a rise will often not work. Put the fly into the general area and be patient…it should produce a take. IT can be puzzling when looking at a selection of Mayfly patterns and then choosing one that's going to work. They can be so different. To help us we must appreciate that there are two principal species, but that each has several stages to its life and can also have regional colour phases. We are really only concerned with Emphemera Danica and Ephemera Vulgata but each starts life in the nymphal form spending about two years living in the silt of a lake bed. As hatching time approaches they swim to the surface or crawl up through weed beds to emerge into the dun stage. This has a sort of matt finish and can vary from pale olive/yellow through to almost black. The dun stage soon leaves the water and takes shelter in nearby shrubbery where it will settle for the night. The following day it will once more split its skin and seemingly hatch again into the spinner stage. This is the sexually mature adult and is a glossy finish with more pronounced body markings, longer tail filaments and shinier wings. Come evening, these spinners, both male and female, fly upwards and mate in the air. The males fall back to the water where they die in the spent position with their wings outstretched. The females fly upstream and lay their eggs before also dying, again in the spent position. Now you can see why there are so many patterns because you might well need to suggest the nymph, the emerger, the dun, the spinner or the spent stages. Today at Barnes Lakes there's a pretty good hatch of fly and a cruise around the lake immediately in front of the lodge finds several fish feeding off weed beds. They provide some action and, as ever with a partial catch-and-release fishery, there are some fish that are just too smart and they defeat me, even though I have this deadly new fly! Moving to Kingfisher Lake, which is rather more open to the breeze, there are more fish moving here as well as some stunning tench in the shallows. These fish will also take a well-cast nymph and are really tough fighters on fly gear, but trout are the target and I have to get Peter a pretty fish so that he can be happy with his day’s work. Feature days are enormous fun and sometimes it’s a struggle to always come up with the goods. I well remember the late Chris Dawn’s words in the preface of my last book when he said that I had never failed to meet any challenge he had ever set me. Chris made an enormous contribution to the success of Trout Fisherman and I hope I always emulate the faith he put in me. This was proving to be one of those days when I could get great takes and generate good action pictures but then drop the fish just when I thought the job was done. What I really want is to have a go at the tench, but the evening is coming with consequent cooling of the margins and the tench are moving off to deeper water. This lack of concentration led me to hustle a hooked trout just a little too much, which meant it would come unstuck just as it was ready for netting. Hence, I was getting a bit desperate but every so often I seem to get lucky and we catch the lovely brown you can see here, although I did foolishly pull my fly away from a real 'beast' of a brown. Nevertheless, this beauty is a fitting testament to John’s lovely water. I will have to go back to try for the tench another day and I wish that it was closer to home. 1. Some fisheries enjoy a really early hatch and it can be mid-April in the far south. 2. The best of the hatch is usually mid-to-late afternoon. 3. Warm evenings can bring on a really heavy fall of the spent fly. 4. 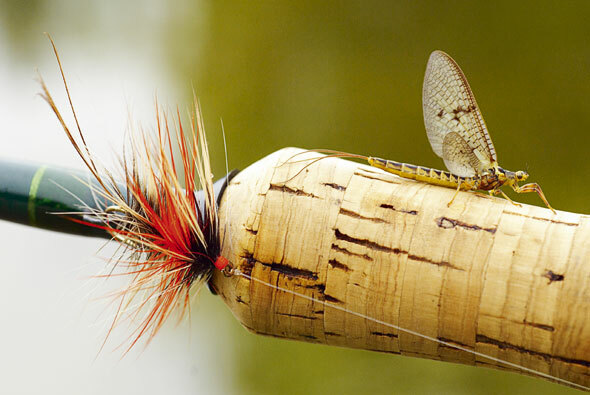 Don’t fish too light a leader; it twists when using big patterns like Mayflies. 5. Expect to find some of the biggest fish feeding on the surface. 6. Look for bird life to give you a clue as to the best hatch area. 7. Listen for the sound of the fish rising, they can be noisy when feeding on mayfly adults. 8. Try around weed beds for fish following the nymph through the weed. 9. A drowned dry is often better than one sitting up on the surface. 10. A trout on a dry is worth 10 on a lure.